Here is an interesting open letter to and indictment of Angela Merkel by Abdel-Samad and a co-author, with an illustrative anecdote at the end. I have tacked on a short article by someone called Guido Grandt that offers supplementary evidence (even though it appeared in January of this year). 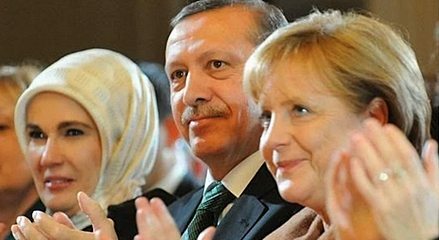 Your are the chancellor of everyone who lives in Germany, so also naturally the chancellor of the Muslims. That does not empower you to claim that Islam is a part of Germany. It is not the job of a politician to rehabilitate or evaluate a religion. Politicians are there for the people, not for the ideologies of those people. Before you publicly make that claim, you are obliged to explain to the citizens of this country what “Islam” actually is. Does the division of the world into believers and infidels also belong in Germany? Or the death sentence for apostates? What do you think of the physical punishments for thieves, adulterers and alcohol drinkers and dissidents? What about women’s rights, which are as good as non-existent in Islam? What about slavery, which is not banned in Islam? What about the right of children to be raised free of fear and without the threat of hellfire? Does all that belong to Germany or Europe too? Or you do know and are purposely deceiving the citizens of this country, to facilitate the sale of tanks to Saudi Arabia (which the public does not want) and so as not to anger our Turkish trading partner. You are wrong. You are deceiving us. And you are doing the Muslims here no favor by claiming something that does not correspond to the truth and which the majority of Germans see differently. Not only them, but many German Muslims and ex-Muslims, who had to flee their homelands to come to this open, free society, which politicians like you are in the process of destroying with drivel about Political Correctness and Globalization. Yes, you — the politicians — are destroying the peace in this land and siccing people on each other. You are further exploiting the deterioration of the situation to gradually decrease basic rights in Europe and accelerate the spiral of forced tolerance (which is never good for a people — read Plato). Anyone who lives here must show respect, and then only a very little tolerance is needed! With that alone, a society develops homogeneously and uniformly and on its own. And people will not be afraid and will gladly deal with the new. Eating kebabs, motorcades are (admittedly silly) examples of that kind of thing. But taking crosses down from churches and re-naming celebrations on orders from above and because of complaints from minorities definitely are not! Whoever lives here must take on German values! Whoever lives here and shows the appropriate respect will receive the documented and protected freedom to live by the ideology he chooses, to believe in what he chooses to believe in. His religion is a protected private affair — but how he lives it in society is definitely not. Understand this at last, and act accordingly, or we will un-elect you, for our measure is full. Many years ago, I was a believing Muslim. I was friends with a German theology student in Augsburg, who wanted to become a religion teacher. He told me the following joke. The butcher answers, “That is my food. I can’t live without it.” Peter refuses him admission until he discovers what this is. Peter asks Jesus whether he can identify this long thing. I was shocked when I heard that joke. How could a believing Christian who wanted to become a religion teacher tell such a joke about the most sacred figures in Christianity? And if he treated his own religion so sarcastically, how would he treat mine? After that, I avoided him. I was afraid of the influence of freedom on me. I barricaded myself behind my faith and become more and more radical,. Satire is a wonderful thing. It attacks fears that you want to hide. It tears the masks from old and new myths, puts gods and cult figures into perspective, and frees us. That is why dictators are insanely humorless and react violently to satire. For our fear is their glory. Today, I am thankful in retrospect for every person who has provoked me with satire and criticism of Islam. Today, I can laugh at anything that is humorous. Today, I understand my old friend from Augsburg. Only freedom makes it possible for a person to be a believer and nonetheless laugh about his religion. In that sense, I do not see Kurt Westergaard and Charlie Hebdo as enemies of the Muslims. They should instead be seen as a gift for Muslims. God be with you, or Allahu akbar! Merkel and Seehofer: “Multiculti Has Failed, Multiculti Is Dead!” — That’s How Stupid Politicians Think Citizens Are! This statement no doubt brought many listeners out of their seats, unable to comprehend it, The chancellor and other, so-called establishment politicians claim something quite different today. And in fact, Chancellor Angela Merkel, on October 16, 2010, at the national convention of the Youth Union in Potsdam, declared the failed attempt of Multiculti! Come again!? “Multiculti has failed, Multiculti is dead”? “Germany must not become the social services country for the world”? and “We are for the defining German culture”? Stunned, we rub our eyes. Did Merkel and Seehofer perhaps write PEGIDA’s support program? Because what the top leaders of the Union at that time had to say was the exact opposite of what they are saying today. Were Merkel and Seehofer lying to the people in 2010? Or are they lying today? Which statements are real? Inquire of your parliamentary representatives and send me their answers. The fact is, the Multiculti discussion makes it clear HOW STUPID THE POLITICAL ESTABLISHMENT BELIEVES THE PEOPLE ARE! This entry was posted in Civil Liberties, Culture Wars, Enrichment, Europe, Immigration, PC/MC, Politics, Religion by Baron Bodissey. Bookmark the permalink. 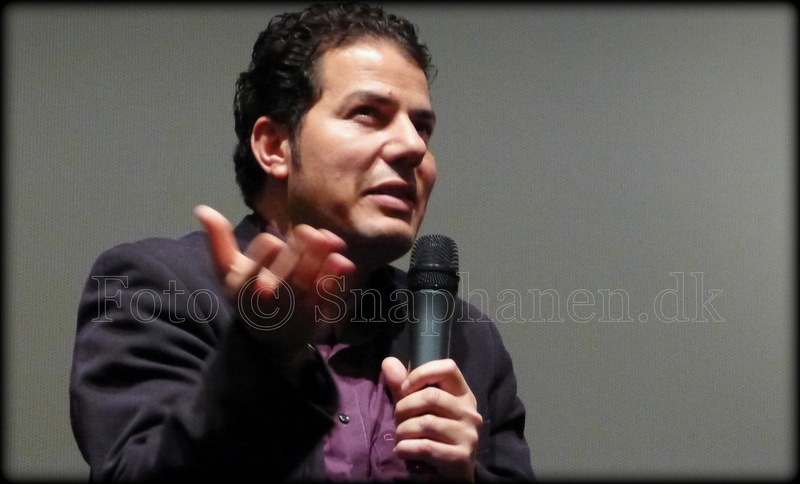 Hamed Abdel Samad, Germany, son of Egyptian imam. Cameron said the same thing, at the same time. Sarkozy too. That is all on record. When coming across an interesting translated phrase like “siccing people on each other”, one sometimes wonders what the original German could have been (answer: die Menschen gegeneinander aufhetzen). And I got a little surprise when I looked for what was translated as “Political Correctness”. Among the multiculti benefits brought in by foreigner are kebabs. But motorcades? Are motorcades an innovation from abroad? I thought motorcades were natively European since at least the pre-Great War days of Archduke Franz Ferdinand. Yea, I didn’t understand the motorcade reference. “Motorcade” in the sense of the article above is referred to high intensity traffic and congestion. Abdel Samad uses increased traffic as an example for all the new things people are willing to deal with. Motorcade translation: Autokolonne, Fahrzeugkolonne. (Line of cars, high traffic). It’s just a weird literal translation. As a resident, I suspect the motorcade reference is to the habit of West Asian immigrants to Europe celebrating e.g. weddings with noisy motorcades of friends and relatives through residential areas. However, I have also witnessed such motorcades by Italian migrants to Germany at their team’s victory in the soccer World Cup. Recently on Good Friday, (probably) ethnic Germans complained to the police in one town that a (Muslim) West Asian ( i.e. Turk? Kurd? etc.) wedding motorcade was ignoring the Christian meaning of Good Friday. The police halted the motorcade, apparently. In Feldkirch in Austria a similar vehicle-based wedding celebration by immigrant Turks recently involving using a street in a suburb as a drag strip. This resulted in the infidel neighbours calling the police, who then had to restrain the culprits. I recall that the equivalent of a SWAT team was needed (“Deus lo vult”) and that there were injuries to the Infidels and the Faithful. Elsewhere, it has happened that West Asian males have closed off German side roads to allow motorcades, naturally on their own extra-judicial self-styled authority. But I have no figures on the frequency of this. Notwithstanding the above, ethnic German weddings e.g. in small towns now also feature motorcades. I do not know whether this was a feature of German culture before Turkish immigration here at the behest of the USA (so as to take internal pressure off its anti-Soviet front line state, Turkey as from ca. 1961.) Probably not, not least because of the low level of vehicle ownership in the early 60s. “We don’t care about your rules. We stop traffic whenever we like. We celebrate us and our islamic cult. Football, wedding, whatever. It will take as long as it will take. We don’t care if you are going somewhere. Ok. German is my mother language. I tried to explain that ‘Motorcade’ is the literal translation of ‘Autokolonne’, which is backed up traffic. Autokolonnen are a major topic all over europe, because they are everywhere. You will not get anywhere anymore in the time it took ten years ago, you have to include at least a half hour on top of regular driving time. Due to the increase not just in immigrants who drive, but also the open borders which means everyone drives everywhere all the time. either the very noisy wedding processions, or the regular speeding “rallies” on the streets. Merkel aims to break the German spirit from the German people by importing Muslims to destroy Germany as a nation. She’s a good Marxist, like Barack and Hollande. Break the spirit? Destroy the nation? Yes. The democratic party in the US is similarly hell-bent against voter ID, thinking that illegal immigrants will naturally vote for those who uphold the right to invade, and social giveaways. Same is true for Israel, the left is adamant about the “rights” of african invaders storming the fences, hoping such immigrants will tip the scales in their political favor. Your first sentence will be correct but the second is not unless by “Marxist” you mean “something and everything I hate” rather than a specific type of social analysis whose features all observers can agree on. The normally neoconservative US readers of this blog would be horrified to recognise the truth of the matter: the USA, like the UK before it (MI6 and the foundation of the Muslim Brotherhood) selects, trains and finances Islamic terrorists. Prior, the aim was to combat Communism or e.g. Nasser’s socialism. Now. the medium-term aim of the US is to break up and vanquish its two rivals with nuclear weapons, China and Russia. Both house Muslim minorities. The key US incendiaries are Tchechens and Uighurs. Members of both groups are fighting with IS. A detailed map showing the breakup of Russia into statelets (think current Libyan intertribal warfare) after US victory (Russian nukes will have instantly vaporised: irony off)can be found on the Net and it may be that it even appeared in the US lame stream media. who controls the Heartland, controls the World Island, who controls the World Island controls the world. It is of course necessary for NATO countries subservient to the USA or rather their intelligence services to go through the motions of combating terrorism so as to keep the sheeple reassured and eventually calling for police states with high spending on the security apparatus to the benefit of a select few. Now and again, a corner is lifted on this dirty blanket: within the last month, the trial of a Swedish national for terrorism in London was cancelled upon the discovery that MI6 is funding the terror group he allegedly fights for. As a Christian I found the joke offensive and blasphemous. However, I am not about to cut off someone’s head because of it. Freedom of Speech is exactly that. ps : I laughed when I read the joke. That’s three Hail Marys for me then. I know, but it’s not me they’re offending and it’s not me they’re blaspheming, they’lll have to answer for that one day, and that’s their business. That’s my view anyway. I, too, was somewhat stunned at the joke, but as Nick said, “they’ll have to answer for that one day, and that’s their business.” All as it should be in a free society. Heaven help us all when/if Islam calls the shots, as it increasingly does, in Western lands. I found the joke funny FUNNY!! But then, I have become innured to politically correct thinking, since to me it just stupid thinking. If you can’t think for yourselve, then shut up already. I apologize if I am, again, being politically incorrect but I still think politically incorrect, as a phrase, should be thrown into the garbage can, espeically in a supposedly free country like ours. In my opinion, there is nothing politically incorrect. People have a right to voice their opinion whether anyone likes it or not. This is how we make a country “unfree” — by sanctioning free speech. Damn them all. May America withstand this latest attack and emerge, again as a free country, once the traiotor leaves office. Dear Baron, I seldom get my dander up this much and I apologize for being unruly. But you know me and how much I support your work. I refuse to be politically correct, and that is the end of the story. I appreciate his letter, but how, how can a Muslim talk this way about Islam when he reads the same Quran as anyone who follows Islam? It perplexes me. Why not just renounce their religion? “Many years ago, I was a believing Muslim” indicates, at least to me, that the author has left Islam far behind long ago. He also refers to “us” as “secular believers and non-believers,” another clue. I hope he survives his public article. Apostasy from Islam is punishable by death, to be administered by anyone, anywhere. Renounce their death cult, I agree. However, then there is the clan culture and the apostasy. The control over the individual. One can but encourage them to renounce their totalitarian ideology. There’s invariably a loophole or a Where’s Waldo? moment when reading these Muslims and “ex-“Muslims. When the Counter-Jihad can put its foot down and stop hungering for crumbs and close but no cigars, it will have passed through the asymptotic force field. As a Christian (of Jewish descent), I feel quite shamed that the best witness Mr. Abdel Samad could hear was a supposed “divinity student” who apparently had no appreciation for anything holy. Had Abdel Samad run into someone with a little more love of God, he might well have joined the growing number of Murtads who are becoming Christians. Having just read through a good chunk of the Acts of the Apostles, my guess is that St. Peter would’ve looked at the Bavarian butcher’s weisswurst and said, “Oh, yeah. God himself had to give me a vision before I was willing to eat with folks who serve trayf like that!” (see Acts 10). First, to the umma, the world community of Islam. Third, to the tribe and ethnic group. Fourth to the language of birth. Fifth, to the nation they are living in, if at all. This is why the west is committing suicide by allowing millions of Muslim “refugees” to enter non-Muslim countries. They have no intention of obeying our laws or assimilating at all. They want sharia law first and foremost. Which fact alone should make people wonder about that Muslim family which just moved in down the street and what their intentions toward us really are. Ban Islam or face the consequences.